This page should provide answers to all your ILL questions. If it doesn't, please contact the ILL Coordinator. To place an interlibrary loan request, first search for the book you want in the Grafton Library Discovery Service (GLDYS). GLDYS searches books in our library and other libraries worldwide. In your search results, GLDYS displays items Grafton owns first. 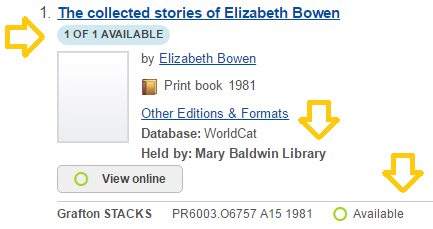 You can tell that Grafton owns a book when you see the blue available button, the "held by Mary Baldwin Library" text or the call number information in the item's record. If Grafton doesn't own an item, all of those indicators will be missing. To request an item Grafton doesn't own click on the title of the book. This opens the detailed view of the item. 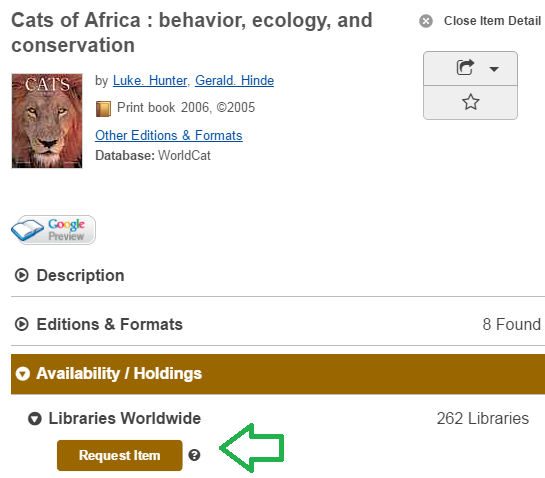 Click on the brown Request Item button under Libraries Worldwide. Fill out the form that follows with your contact information. An e-mail will be sent to you when the book/article arrives (which is usually 5-10 business days). You can pick it up at Grafton's Circulation Desk, or have it mailed to you if you're an off-campus student. Alternatively, you can also fill out the Request / Renew form with your contact information and information about the book you want. Find the Request / Renew form in the main navigation above. How do I request a journal article? Pick the message on the left FIRST, the one that says "Find full-text at MBC." When you click this link, you are checking to make sure MBC doesn't own this article in another one its databases by using the Journal Finder (Our databases don't talk to each other, so Academic Search Complete doesn't know what CINAHL with full-text has). For more information on how to check for your article in the Journal Finder, see Finding Full-Text from a Citation. If Grafton has access to the article in question, great! You're all set. If we don't, click on the right-hand link where you originally found the article in the database (image above), the one that says "Request this item through interlibrary loan", and fill out your contact information in the form that follows. If you prefer to search GLDYS for journal artices you can use a similar process as outlined above for books. You may be in a database that doesn't have direct links to Request the item through ILL. In that case, you can request an article by filling out the Request / Renew ILL form with your contact information and information about the article you want. You can find the Request / Renew form in the main navigation above. How do I request a book chapter? To request a book chapter, fill out and submit the Request / Renew ILL form. You'll find it in the main navigation above. What can I request through ILL? You can request pretty much anything you need. Can I request popular movies or television series? Unfortunately, no. Interlibrary loan is meant to help you access material for your research. If you have questions about requesting a specific title, please contact the Interlibrary Loan Coordinator. No. Any materials being used as textbooks or assigned readings during the current semester may not be requested through ILL. Please visit the MBC Bookstore or you preferred online bookseller to purchase copies. Can I request a book that is checked out? Yes. Just submit the request as a normal ILL book request. Is there a limit on the number of items I can request? No. Feel free to submit as many requests as you like! Library fines are $.25 per day, per item for late material. When items become seven or more days overdue your ILL borrowing and library circulation privileges will be suspended. The suspension will be lifted once the material is returned. If material becomes 10 days or more overdue a non-refundable charge of $35 may be added to you account. For more information on late returns, see the Late, Lost, or Damaged items section. Is there a charge to use the ILL service? No. The cost of obtaining most ILL materials is covered by Grafton Library. However, there are some cases in which materials would have to be paid for by you. In these rare cases we will ask for your authorization in advance. Charges generally range from $10 to $35 per item. How long does it take for books and other loanable materials to arrive? Books usually arrive within 5-10 business days, but can take up three weeks. We cannot guarantee a specific delivery time so please order early. How long does it take for articles to arrive? Journal articles usually take 1-3 days to arrive, but can take longer; so order as far in advance as possible. The majority of articles are received by the ILL office electronically, in PDF format, and will be forwarded to you via email. How long does it take for chapter copies to arrive? Book chapter copies usually arrive in 2-7 business days. The majority of copies are received by the ILL office electronically, in PDF format, and will be forwarded to you via email. How do I know when my material has arrived? When requested material arrives at Grafton, you will be notified by email. Where do I pick up requested books? Books should be picked up at the circulation desk. Books are available as early as 4 p.m. on the day you receive the email notification that your item has arrived. You can pick it up anytime after that during normal library operating hours. Books will remain on the shelf until they are picked up or become overdue. It is your responsibility to pick up your material on time or let the ILL office know that you no longer need the item. Items that are not picked up on time will accrue overdue fines. Where do I pick up requested articles? Articles are usually received by the ILL office electronically and forwarded to you via email. You will either be sent an email containing a URL and password for accessing the document (which will be in PDF format) or an email with the document attached. All picked up from Grafton library should be returned to the circulation desk on the main floor of the library. If the library is closed, you may use the drop box located to the right of the front doors. Where do I return my articles or chapter copies? Copies of journal articles and book chapters do not need to be returned; they are yours to keep. Do keep in mind that the Copyright law of the United States (Title 17, United States Code) governs the making of photocopies or other reproductions of copyrighted material. Under certain conditions specified in the law, libraries and archives are authorized to furnish a photocopy or other reproduction. One of these specified conditions is that the photocopy or reproduction is not to be "used for any purpose other than private study, scholarship, or research." If a user makes a request for, or later uses, a photocopy or reproduction for purposes in excess of "fair use," that user may be liable for copyright infringement. This institution reserves the right to refuse to accept a copying order if, in its judgment, fulfillment of the order would involve violation of copyright law. I am a distance student. Will you mail my items to me? Yes. If you live outside the Staunton/Augusta area we will mail your items to you, free of charge. When you are finished with the item, return it by mailing it to the library. You are responsible for return shipping. How long can I keep books requested through ILL? Due dates are determined by the lending library and appear on the sticker on the front of the book. Most libraries lend material for 4-8 weeks, but sometimes up to 12 weeks. 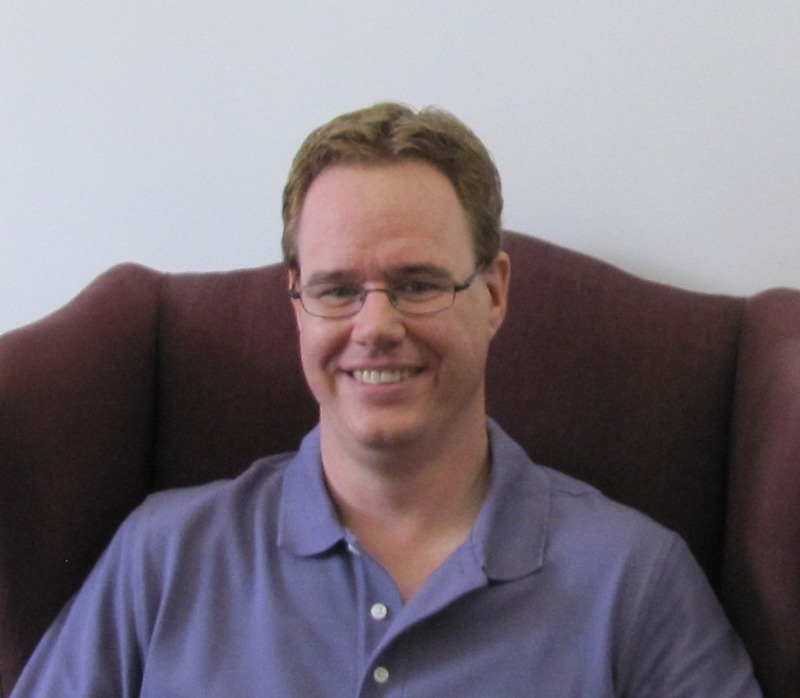 The Interlibrary Loan Coordinator strives to obtain material for the longest possible lend time. How long can I keep audio/visual material requested through ILL? The loan period for audio/visual material is usually shorter, anywhere from 1-2 weeks, and is sometimes restricted to in-library use only. How long can I keep articles & chapter copies requested through ILL? Do keep in mind that the Copyright law of the United States (Title 17, United States Code) governs the making of photocopies or other reproductions of copyrighted material. Under certain conditions specified in the law, libraries and archives are authorized to furnish a photocopy or other reproduction. One of these specified conditions is that the photocopy or reproduction is not to be "used for any purpose other than private study, scholarship, or research." If a user makes a request for, or later uses, a photocopy or reproduction for purposes in excess of "fair use," that user may be liable for copyright infringement. This institution reserves the right to refuse to accept a copying order if, in its judgement, fulfillment of the order would involve violation of copyright law. You are responsible for returning your ILL item on or before the due date indicated on the sticker. The Library will send you courtesy notices to remind you of an impending due date, or that a due date has passed. Failure to receive these courtesy notices does not excuse you from returning the item by the due date (Check your spam folder). What if I return an item late? Failure to return ILL materials on time may result in fines, replacement charges and possibly having your ILL and library circulation privileges restricted or suspended. Library fines are $.25 per day, per item. See the Fines & Fees section for more on late charges. You are financially responsible for any damage to or loss of interlibrary loan materials. Fees are determined by the lending library and can range anywhere from $15 to over $100. We do not accept replacements for damaged or lost items. Can I renew my ILLs? Possibly. Renewal policies vary among libraries and renewals are made at the discretion of the lending institution. We cannot guarantee an item will be renewed. First, check the ILL sticker on the item to see if it says "NO RENEWALS." If it does, then a renewal is not possible and you will need to request the item again. If it does not say "NO RENEWALS" then a renewal might be possible. If a renewal is not possible, you may request another copy of the item. How do I renew or reorder my ILL items? Try to submit renewal/reorder requests about 5-7 days prior to the due date to allow sufficient time for new copies to arrive. Please do not submit requests earlier. There are two ways to submit a renewal/reorder request. When possible, please fill out and submit the Request/Renew Form and choose the "Renew an item" option. You'll find it in the main navigation above. Indicate if this is a renewal or reorder request. Check the ILL sticker to see if it says "No Renewals." If it does, then you must make a reorder request. If the renewal is denied, do you want another copy of the item? How long do renewals take? Renewal requests are generally answered in 1-3 days. How will I know if my item was renewed? You will be notified via email about the status of your request. How long is the renewal period? The renewal period is usually four weeks, but can be as little as one or two weeks. If you will need the item longer, please submit a reorder request. Items cannot be renewed twice. How do I cancel a request if I no longer need the material? Send an email to the Interlibrary Coordinator as soon as you know you do not need the material. Interlibrary loan requests can be placed easily though GLDYS, Grafton's discovery service. Simply find the item you want and use the options within GLDYS to request your item. You can request books, book chapters, articles and item renewals through our ILL Request / Renew Form.